Thank you to my colleague, Professor David Ketcham, for pointing me to this hilarious video featuring the famous comedic character, Father Guido Sarducci. The video is very funny, in part because it contains a kernel of truth about college education in America. The Eureka myth: the truth is that most great creative ideas do not emerge in a flash of instant brilliance. The Lone Creator myth: the truth is that many great ideas are works of collaboration, not the product of a lone genius. The Brainstorming myth: the truth is that brainstorming itself is not a bad thing, but the notion that it will produce a fully formed idea that translates directly into a successful innovation... that's a mistaken belief. The Constraints myth: the truth is that creative potential is not necessarily diminished by constraints. Constraints, indeed, can be helpful in the innovation process. To learn more about the book, check out this feature on CBS This Morning about Burkus' work. Should You Trust the Expert? Rick Larrick and Jack Soll, business professors at Duke University, have shown that when given a chance to do so, people often prefer to rely on experts. In laboratory experiments, they found that where experts disagreed, people would deem the “most able” among them and trust that individual’s judgment more. Despite this perception, the average forecast often outperforms the best individual’s forecast. Such outperformance happens when forecasts bracket the true result. In their column for the Washington Post, the two Darden Professors examine past data from the Federal Reserve Bank of Philadelphia, an institution that surveys economists and relies on averaging of the individual forecasts. They found that, "The crowd beat the expert in 63 percent of the 40 quarters. Not surprisingly, any two forecasters in the survey often bracketed the truth, bracketing on average 28 percent of the time." No surprises here... we have known about the wisdom of crowds for some time. What is fascinating is that people tend to want to rely on the individual expert. They prefer the expert over the crowd... absolutely the wrong strategy. Our Environment Shapes Our Behavior... even though we don't always recognize it! Several years ago, Michael Mauboussion wrote a good book titled, "Think Twice: Harnessing the Power of Counter-intuition." At one point, he describes an experiment by Adrian North, David Hargreaves, and Jennifer McKendrik regarding the sale of wine in supermarkets. Researchers examined whether consumers would choose a French or German wine, when the products were placed next to each other on the shelves. In some weeks, French music played in the aisle. In other weeks, German music played. Consumers said that the music did remind them of the associated country, but they said that the music had no impact on their buying decision. However, they were completely wrong! Consumers bought French wine 77% of the time when French music played. However, when German music played, they bought German wine 73% of the time. What's the lesson here? Our environment really does shape our behavior, and we often underestimate how much the situation/environment influences us. It's very easy for us to believe that we would have behaved differently than others or made a different decision than the flawed choice they made in a particular circumstance. Yet, what would have happened to us given those same situational factors they faced? When I teach a case on the Columbia space shuttle accident, many students and executives often indicate that they would have behaved differently than the engineers there. They claim that they would have spoken up more forcefully about the dangers of the foam strike and the need for more investigation. Would they really have behaved differently? It's easy for us to say that we would act differently, but are we recognizing and admitting how much environment, culture, and situation shapes our actions? Francesca Gino, Leigh Plunkett Tost, and Richard P. Larrick have conducted a fascinating study on power and leadership. For one of their experiments, the scholars used the Everest Leadership and Team Simulation that Amy Edmondson and I developed. The simulation enables students and executives to learn by doing. They experience challenging team decision-making in a virtual climb of the world's tallest mountain. Participants work in five-person teams in this virtual climb, and they face increasingly challenging decisions as they ascend the mountain. One person serves as the leader. Four others adopt pre-assigned roles, such as a team physician and team photographer. The scholars decided to modify the simulation, by asking some leaders to consider a time when they had control/power over others. They asked those leaders to write about that situation, prior to conducting the simulation. Other leaders did not engage in this "priming" exercise. What did they find? The "high-power" leaders (those primed to think about a situation in which they exercised power/control over others) tended to dominate the group conversation. Their comments accounted for 33% of the air time during group deliberations in the simulation. The other leaders only spoke 19% of the time! Did the difference in leader behavior affect group performance? It did! The groups with "high-power" leaders achieved 59% of their goals (slightly below average in my experience running the simulation). The teams without a dominating leader achieved 76% of their goals, a very solid performance. Why? The teams with a dominating leader missed key clues and did not share and integrate information effectively. Gino explains, "Even subtle ways of making people feel powerful have powerful effects on behavior." Imagine, then, the effect that truly powerful executives have on group deliberations. If this simple "priming" had such a significant effect, what is the impact of a dominating, charismatic, powerful chief executive in "real world" settings? What Did the Dissenter Say? Great Question! Often in meetings, I will ask people when we’re discussing an idea, “What did the dissenter say?” The first time you do that, somebody might say, “Well, everybody’s on board.” Then I’ll say, “Well, you guys aren’t listening very well, because there’s always another point of view somewhere and you need to go back and find out what the dissenting point of view is.” I don’t want to hear someone say after we do something, “Oh, we should have done this.” I want us to listen to these dissenters because they may intend to tell you why we can’t do something, but if you listen hard, what they’re really telling you is what you must do to get something done. It gets you out of your framework of the conventions of what you can and can’t do. I love the question: What did the dissenter say? Often, people come to the leader with a recommendation. They are both the advocates for a particular plan, as well as the primary information gatherers and analysts of the situation. They clearly have strong vested interest. (bias!) Asking about the dissenters insures that you are not simply hearing advocacy. Moreover, it enables the leader to dig into the advocates' decision-making process a bit. Did they reach out to hear opposing opinions at all? Did they consider alternatives? Did they probe and test their assumptions? If they stumble on this question, then you know that their decision-making process has key weaknesses. At this point, as a leader, you can conclude that you are not in a good position to make a tough call. Your team is not providing you with the right information, analysis, and advice. Mentoring networks involve shared learning between two people. Too many people enter the relationships thinking of themselves as plebeian protégés who get support. Savvys, on the other hand, realize they have something to offer their mentors, too, and help them out whenever they can—which gives the other person a deeper vested interest in them. Mentoring should be a two-way street. Are you in an industry facing rapid technological change, or being disrupted by new internet-based technologies? If so, senior executives may need to hear from young voices. They may need to understand how millenials think, act, and consume products and services. In some cases, firms will have established reverse mentoring programs, so that the veteran employees can learn from the millenials. Suppose, though, that your firm has NOT embraced such a cutting edge program. As a protege, you can still work on making a mentoring relationship mutual, by offering insights about societal and technological trends, and by letting the senior person "hear the voice of a millenial" on key issues. In short, as a protege, you can become a "mini-focus group" for the senior executive. You can offer them insight into how millenials consume (or don't consume) the firm's products. By offering that perspective, you can make a mentoring relationship mutual and provide real value to that mentor and the firm as a whole. Here's the key though: Don't bring your opinions to the table. Bring your data. Bring insight into how millenials think and act, rather than offering your view on what the firm should do. It can easily be considered brash and arrogant to start telling senior executives how to change the firm's strategy. However, offering them insight into consumer behavior (just the facts) can help guide them to a rethinking of an outdated strategy, while avoiding a defensive response. How do we value things? "Beer and art share an awkwardly named property: they’re “inherently inevaluable.” Some concepts are easy to evaluate without a reference standard. You don’t need a yardstick, for example, when deciding whether you’re well-rested or exhausted, or hot or cold, because those states are “inherently evaluable”—they’re easy to measure in absolute terms because we have sensitive biological mechanisms that respond when our bodies demand rest, or when the temperature rises far above or falls far below seventy-two degrees. Everyone agrees that three days is too long a period without sleep, but art works satisfy far too abstract a need to attract a universal valuation." In these situations where products are "inherently inevaluable," we look to certain cues to try to ascertain the value of an item. Unfortunately, we pay attention to all the wrong cues. Is the product sold at a fancy hotel or a cramped restaurant with outdated furniture and decor? Is the product sold by someone in a fancy suit or a shabby t-shirt and jeans? As Alter says, " We’re swayed by all the wrong cues, and our valuation estimates are correspondingly incoherent." Think for a second about the types of products that you buy that may not be easy to value. What cues command your attention? Now, think about the products your firm sells. What cues do you present the customer? Are they helping to increase or decrease the perceived value of that product? Here's a terrific short video from the University of Chicago's Booth School of Business. The video explores the latest trends in consumer research. Walt Disney and Netflix unveiled a deal for multiple original live-action series based on four of Marvel's most popular characters to be shown exclusively on Netflix's streaming-video service.Under the agreement, Marvel will develop four serialized programs—"Daredevil," "Jessica Jones," "Iron Fist" and "Luke Cage"—leading to a miniseries programming event for Netflix. Netflix has committed to a minimum of four, 13-episode series and a culminating Marvel's "The Defenders" miniseries. What's the logic here? I think Disney has not only found a new outlet for its content, but it has found a creative way to experiment with new vehicles for some of its Marvel characters. If one of the characters becomes highly popular on Netflix, it can then choose to build feature film vehicles for these characters. Netflix then becomes a way to experiment, as well as a way to build audience in anticipation of a feature film release. Netflix also may offer a better fit from a distribution perspective than some of Disney's own networks (such as Disney Channel or ABC Family). For Netflix, it offers more exclusive content to attract loyal subscribers. It seems like a win-win for both parties. On this Veterans Day 2013, thank you to the men and women who have served our nation and defended our freedoms. We are very grateful for your service and your sacrifice. The Wall Street Journal reports today on a study by Maryam Kouchaki and Isaac Smith published in Psychological Science. In a series of experimental studies, their research shows that people have a great tendency to engage in unethical behavior in the afternoon than in the morning. Why? According to the newspaper, "The researchers found evidence that, as the day wears on, mental fatigue sets in from hours of decision making and self-regulation, raising the odds of transgression." It makes me wonder... have any studies examined whether people are more likely to engage in unethical behavior while multitasking? Does distraction work in the same way that fatigue does, raising the odds of transgressions? The Wall Street Journal reports today that Walt Disney CEO Bob Iger indicated that the company would not be divesting its local television stations. He said that, as long as the firm owned the broadcast network, it would also stay in the business of operating some local affiliates. However, when pressed as to whether Disney might consider divesting both ABC and the local affiliates, Iger seemed more noncommittal. In my strategic management courses, I push my students to consider the merits of Disney's vertical integration strategy with regard to the purchase of ABC in the 1990s. Interestingly, many entertainment firms pursued vertical integration strategies at that time (think AOL-Time Warner and Viacom-CBS), but many of those companies have reversed those strategies in recent years. 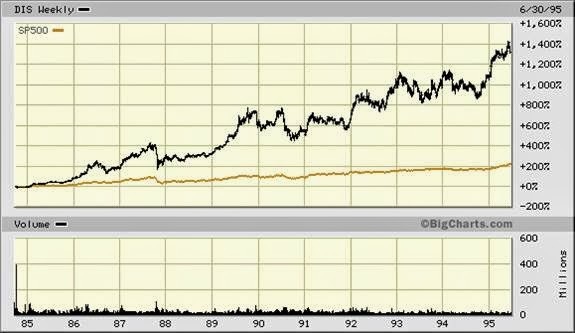 I often remind students that herd behavior happens in industries... in the 1990s, vertical integration became the conventional wisdom. At a second glance, there are many arguments against the purchase of a broadcast network by a content provider such as Disney. 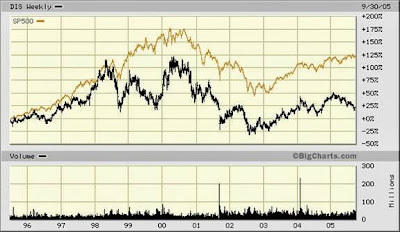 Here are two stock charts. The first shows the Disney stock performance from the day Michael Eisner became CEO until the day prior to the announcement of the ABC deal. The second shows the stock performance from the day of the deal until Eisner's resignation. As you can see, the stock outperformed the S&P 500 index by a wide margin prior to the deal, but underperformed after the acquisition. Clearly, other factors caused the subpar performance post-deal, but still, the chart suggests that this vertical integration play may not have been as positive as envisioned at first. Scholars Paola Sapienza, Luigi Guiso and Luigi Zingales have conducted interesting new research on the topic of corporate values and integrity. Kellogg Research Insights reported on the research. In that article, Sapienza notes, "We didn’t find any correlation between the cultural values that a company advertises and what its employees perceive from the inside once they're working there." In other words, it really didn't matter whether a company crowed about its values and integrity on its website or on other publicly available documents. The bottom line: employees watch what managers do, not just what the company says on paper. Employees make an independent determination as to whether the company and its senior leaders have integrity. They watch to see who walks the walk, as opposed to worrying simply giving credit to those who talk the talk about integrity. Ok, the research results don't surprise most of us (that doesn't stop scholars from claiming that their findings are surprising... it helps get you published, after all!). Still, the findings should remind us to take another look at how we "walk the walk" at our firms. As leaders, what do we do that might contradict public proclamations about values and integrity? Have we given our employees any reason to doubt the authenticity of our claims about honesty, integrity, and respect for one another? Last night, Martin Keen spoke here at Bryant University. Keen is the co-founder of Keen Footwear. Several years ago, he sold his stake in that company and founded Focal Upright Furniture. 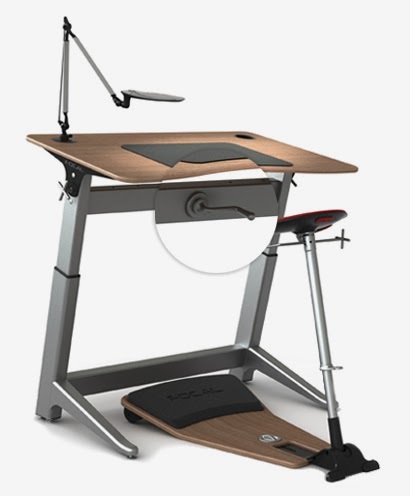 The company offers "all the advantages of a standing desk with the ingenious option to relax on the Lotus leaning seat." The design for his upright desks has earned numerous awards. Google and Apple have both purchased some of his products. Keen spoke about how sitting at our desks all day is harmful to our health. He showed how the typical human's spine looks very different today than it did 100 years ago, when we were much less sedentary. It was a fascinating discussion worth thinking about as we design our office spaces and consider how we accomplish our work. For more on "sitting disease" see Nilofer Merchant's TED talk below. A group of 14 "pilot" episodes had been posted on the company's website a month earlier, where they were viewed by more than one million people. After monitoring viewing patterns and comments on the site, Amazon produced about 20 pages of data detailing, among other things, how much a pilot was viewed, how many users gave it a 5-star rating and how many shared it with friends.Those findings helped the executives pick the first five pilots—winnowed down from an original pool of thousands of show ideas—that would be turned into series. The first will debut this month: "Alpha House," a political comedy about four politicians who live together, written by Doonesbury comic strip creator Garry Trudeau. Amazon is taking advantage of the wisdom of crowds. Traditional networks use focus groups to test out ideas for new shows. Aren't thousands of reviews better than the responses from a small number of people in focus groups? After all, focus groups can be very problematic, and not simply because of the small sample size. Well... it depends. The wisdom of crowds works when the responses from a larger, diverse audience are INDEPENDENT of one another. In other words, the wisdom of crowds works when each individual response does not influence the response of others. Does independence hold when it comes to online reviews, or does herd behavior take place? Tim Harford of the Financial Times asked this question in a recent column. He cites an interesting study that I blogged about earlier this fall. According to the Wall Street Journal, researchers Muchnik, Aral, and Taylor found that, "positive online ratings can be strongly influenced by favorable ratings that have come before." They discovered that initial positive ratings did create herd behavior. Ratings that followed were more likely to be positive as a result of the influence of the initial evaluations. According to Harford, "Positive comments tended to attract birds of a feather – a comment sent into the online world with a single positive vote attached was 30 per cent more likely to end up with at least 10 more positive votes than negatives." Interestingly, initial negative ratings did not lead to similar herd behavior. People who liked a product often chimed in to "counterbalance" an early, unusually negative review. There's a pattern here. Both companies make much better decisions because they don't rely on hierarchy, PowerPoint, persuasion. They're making decisions based on real experiments. So I said, wait a minute. Whenever reasonable, let's move from decisions by persuasion to decisions by experiment. Three things happen. One, you make better decisions because it's actually real consumers or real production methods that aren't based on theory or a PowerPoint. It's based on real results. That's one. Two, you enable your most junior people to test their best ideas, and when in you're doing PowerPoint presentations, whose ideas are most likely to get lost? The third is, you get surprises more often, and surprises are a key source of innovation. You only get a surprise when you are trying something and the result is different than you expected, so the sooner you run the experiment, the sooner you are likely to find a surprise, and the surprise is the market speaking to you, telling you something you didn't know. Cook does a very nice job here of explaining three key virtues of a shift toward experimentation. I often advise executives that experiments can be a very effective tool for resolving key differences of opinion. I encourage leaders to stimulate constructive debate. We make better decisions if we encourage dissenting views. However, sometimes we then find ourselves in a difficult spot. An impasse emerges, and it's not clear how to resolve the differences of opinion that have emerged. In those instances, how can we manage the conflict constructively? One way to do so is through experimentation. Rather than continuing to hold meetings and debate the issue, we can shift toward experimentation. Ask yourself: What are some of the key assumptions and hypotheses at the core of the arguments being made? What could we do to test some of the key assumptions and hypotheses that have been put forward here? Experiments, then, can become a way to manage conflict constructively and advance a decision-making process that is stuck in a stalemate.